If you were to ask us where to get some killer pizza in the city, man, do we have suggestions for you. Narrow down your search more specifically, like killer pizza that’s both cheap and you can customize, and we’d know exactly where to send you: &pizza. Yes, with an & and not an “and”. 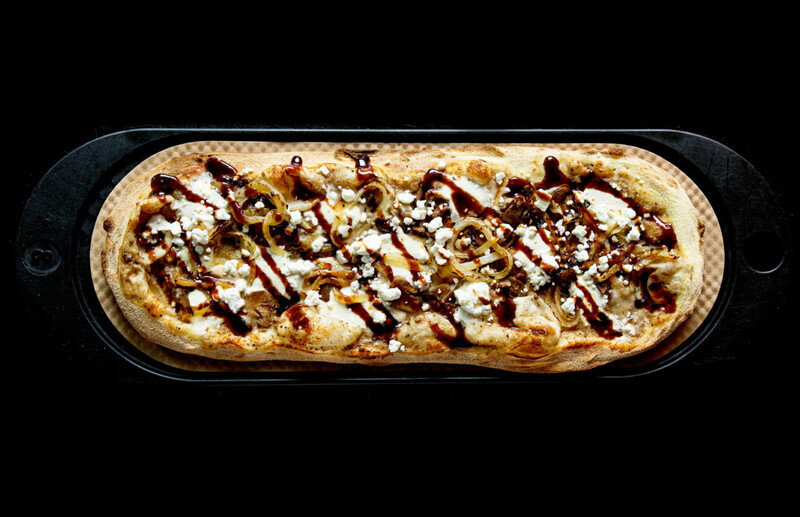 At &pizza, all your wildest cheesy meaty veg-tastic dreams come true, and that’s not an exaggeration. Planted just far enough away from tourist-land but still in a central spot, &pizza is way too accessible to nearly any Manhattan-ite. The chain restaurant opened its Flatiron shop in June and opened another in Soho just a few months later. Every restaurant has its own theme reflective of the city or area, and &pizza’s Flatiron location is no different. My guest and I arrived at the black and white-themed storefront, where we met a smiling staff member offering passersby pizza samples. If we could characterize the spirit of this restaurant in one person, that staff member would hit the nail on the head. Upon walking in, we noticed sweeping marble counters and black and white graphic designs throughout the restaurant. The designs, we learned, were created by local artists to reflect Flatiron’s sleek yet fun vibe. The strobe light-like design mimic Broadway and the subway tiles line the wall. It’s a New York restaurant — that’s for sure. 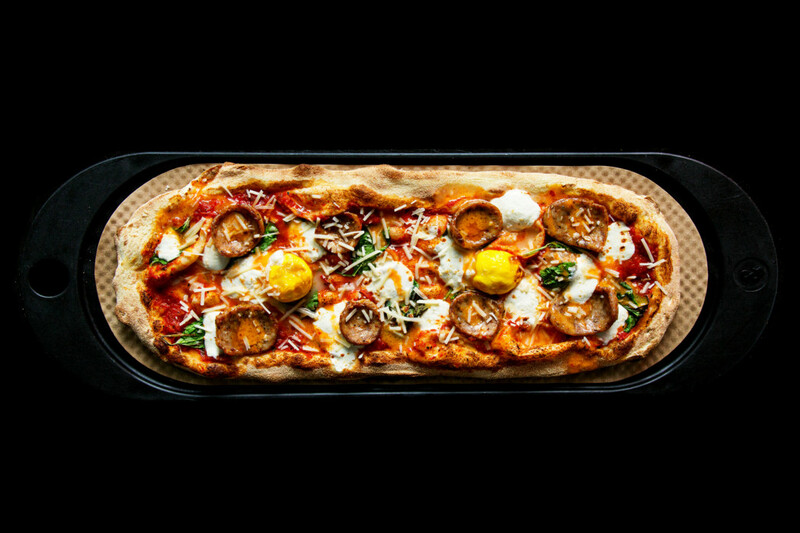 The coolest thing about this pizza chain is that every pizza, which resembles a flatbread, is made to order right in front of you and flash-cooked for a flat fee of $9.09, no matter how many extra toppings you want. For my guest and I, we decided to test a few different pizzas — they’re fairly small, so one hungry person could easily finish one. The menu includes a few pre-made specialty pizzas as well as a list of ingredients to choose from to make your own. We decided to split the American Honey, which includes spicy tomato, mozzarella, pepperoni, arugula, red pepper flakes, goat cheese and hot honey, and also make our own pizzas. For me, I chose an original crust with spicy tomato sauce, mozzarella, salami, spinach, basil and fig balsamic while my guest chose the original crust, mushroom truffle sauce, chicken, mozzarella, arugula and…yep, fig balsamic. The American Honey was honestly too good to be true. The hot honey paired with the creamy goat cheese and thin, crispy crust was a combination we can’t believe we’ve been living without, while the mushroom pizza had a rich truffle taste we savoured till the end. As for the second make-your-own pizza, the spicy tomato sauce and fig balsamic married nicely. &pizza is that pizza place visitors and locals alike would be lucky to stumble upon. For the ridiculously low price, you’ll wonder what you’ve been doing all this time at the dollar pizza shops and tourist-trap pizzerias. You want something fresh, cheap and customisable? You know where to go.